Rock climbing opportunities are limitless in the Costa Blanca. This is Spain's most varied and developed climbing area. 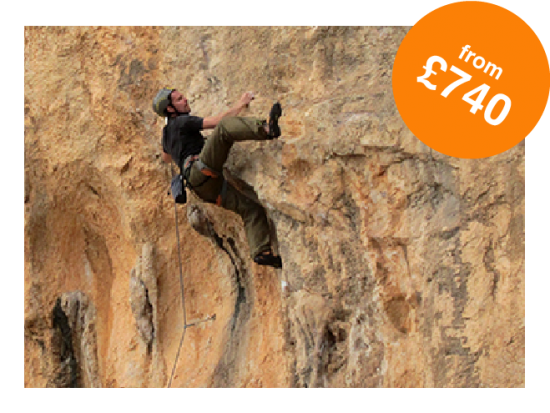 Providing a variety of single and multi-pitch sport climbs, traditional routes, sea cliffs and mountain crags. Blue seas, white beaches and terraced fruit groves set against panoramic mountains, the Costa Blanca has it all. Its Mediterranean climate means good climbing conditions all year round. Add to that the frequent and convenient low cost flights... and you understand why Costa Blanca has become our clients' favourite European climbing destination. The Costa Blanca has enough quality limestone rock for a lifetime of climbing. The area offers a wealth of climbing for all grades and styles: sea cliffs, mountain ridges, single pitch crags and canyon walks. At Rock & Sun we know all the local crags as well as the known ones, so we can pick the right crag for all weather conditions and to suit all abilities. Top quality, fresh limestone climbing, overlooking the sea or surrounded by the green hills of the Jalon valley. Our most favourite rock climbing holidays in the Costa Blanca are the Sport Climbing Holiday, the Performance Coaching Course and the Long Weekend Climbing. Besides single pitch sport climbing, the Costa Blanca is home to some of Spain's most exciting multi-pitch climbing. During The Big Five you will climb five of the classic big multi-pitch routes in the area. Routes ranging from 3 to 13 pitches guarantee adventurous climbing experiences. 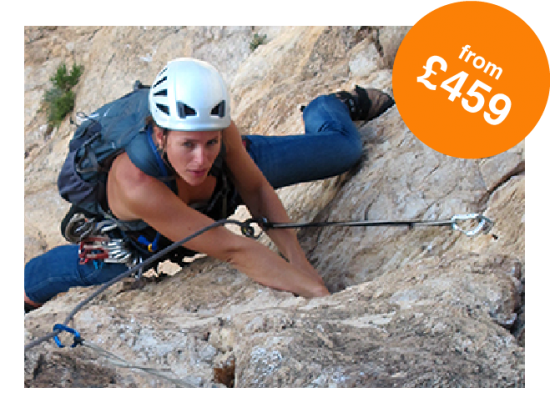 It is also possible to go traditional climbing in Costa Blanca on leader placed protection. The featured limestone rock and abundance of easy routes is ideal for learning how to place cams and nuts. For women who prefer to climb in an all female environment and focus specifically on efficient movement and finding technical solutions for naturally not being very strong, we organise a Women Only Climbing Holiday. Finally our Family Climbing Holidays can be tailored to the specific needs and experience levels of your family. 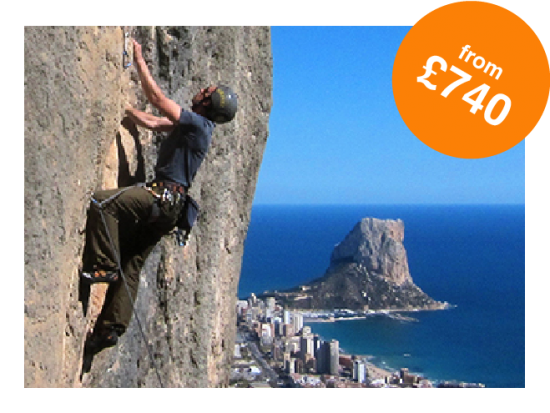 There are an additional couple of perks to rock climbing in Costa Blanca with Rock & Sun. Over the last years we've been working hard to develop new routes that haven't seen traffic from other climbers. Current guidebooks may list all the great crags developed over the last 5-10 years, but we can lead you to some almost untouched climbs. There are whole crags that are not in guidebooks - and there are still many more climbs to be discovered! Also, a penny from every pound of your Costa Blanca climbing holiday cost will be paid into a bolt fund that helps develop and upkeep new and existing crags (e.g. cleaning and bolting new routes; developing and maintaining access paths; replacing tired bolts) - so helping to sustain rock climbing in Costa Blanca. With an average of 300 days sunshine each year, this is probably the best rock climbing destination in Europe. You can climb in Costa Blanca all year round. In the height of summer we manage the heat by getting out early to climb, then have a siesta like the Spanish, and maybe go out climbing again late afternoon or early evening depending on your course or holiday. You will be staying in a self-catering villa with swimming pool in Calpe or the Jalon Valley. We offer one free transfer to your accommodation (which will be the start date of your holiday – normally a Saturday) which departs from Alicante Airport at 2.00pm latest. To take advantage of this service, and in order to minimize waiting times, please aim for midday arrivals. On departure day (the end date of your holiday - normally a Saturday) we offer one free transfer to Alicante Airport which departs the villa around 8.30am. We therefore suggest to aim for midday departures. If you wish to travel to the accommodation independently, or if you can't buy a flight within these hours, transfers may be arranged, subject to availability, on alternative days/times. Contact us for more information. The transfer time from Alicante to the Jalon valley is approximately 1,5 hour. ...from the very start when I initially inquired about the holidays/courses and was provided with an array of trips that would be appropriate based on my current level of climbing skills. The location, on the Costa Blanca was fantastic. A really beautiful place with lots of fantastic crags, and something different to try every day. Our instructor, Sergi, was an excellent, patient coach who worked really hard to ensure that everyone got something out of each day despite the range of climbing experience and ability. Although on the "holiday", Sergi did lots of coaching throughout the week. I feel like my climbing has really improved as a result. From having had no formal teaching on climbing techniques before and just trying as hard as I could to get up a route. I learnt lots of important stuff about route finding, footwork, and the most efficient ways to climb something. I hope to put this into practice back home! Best of all, I got to lead routes that were harder than I've ever led before. So it's onwards and upwards from here! Thanks so much Sergi and the whole of the Rock and Sun team. ...from the very start when I initially inquired about the holidays/courses and was provided with an array of trips that would be appropriate based on my current level of climbing skills. The location, on the Costa Blanca was fantastic. A really beautiful place with lots of fantastic crags, and something different to try every day. Our instructor, Sergi, was an excellent, patient coach who worked really hard to ensure that everyone got something out of each day despite the range of climbing experience and ability. Although on the "holiday", Sergi did lots of coaching throughout the week. I feel like my climbing has really improved as a result. From having had no formal teaching on climbing techniques before and just trying as hard as I could to get up a route. I learnt lots of important stuff about route finding, footwork, and the most efficient ways to climb something. I hope to put this into practice back home! Best of all, I got to lead routes that were harder than I've ever led before. So it's onwards and upwards from here! Thanks so much Sergi and the whole of the Rock and Sun team. ...and just great to spend time with. His coaching was first class, and always patient and supportive. Thank you for running the course over Xmas even though I was the only client. ...I could not be happier with him. He had amazing knowledge and was a fantastic and patient teacher. Hopefully the training and drills and the awareness of the problems will help me to address them and get better. It was not an issue of the training from Sergio (which was outstanding) but the range of ability and motivation of the team made it difficult to tailor the course for everyone (but Sergio did a great job here as well). Next year I will try one of the other offerings such as the "Big Five". Hopefully the training and drills and the awareness of the problems will help me to address them and get better. It was not an issue of the training from Sergio (which was outstanding) but the range of ability and motivation of the team made it difficult to tailor the course for everyone (but Sergio did a great job here as well). Next year I will try one of the other offerings such as the "Big Five". Clear, methodical and patient. Big emphasis on safety which I valued highly as someone relatively new to outdoor climbing. The area has a fabulous wealth of crags and routes, with a wide variety of grades, something for everyone. The accommodation is basic but comfortable and it was fun being all together with the town close by. ...and really beat my expectations. Amazing climbing, great company, and incredible coaching. I can't believe how much I improved in just three days! ...and excellent instruction from Desiree and Trevor. I hope to come back at some point in future! ...thanks very much to Trevor and Desiree for their tips and local knowledge! I didn't use the transfer so can't comment on that. Villa was great. I was very happy with the crags chosen and enjoyed some really high quality routes. ...It is the best coaching I've had and I took away so much from it! I'd love to join another course and am hoping to come to Thailand. ...who really made me feel welcome and comfortable despite the fact it was my first time climbing. I really enjoyed the experience and would highly recommend. ...Committed to making every aspect of the experience as memorable and educational as possible. They were instrumental in improving both my climbing technique and my confidence in leading. I expected to have a lovely holiday in Spain where I would be able to rock climb, but the reality was so much more. Everyone I climbed with was positive, helpful and enthusiastic. I am looking forward to enjoying time with them at their other climbing venues. ...delivered in a thoroughly professional, courteous and calm manner. The team have a wealth of experience that I as a novice greatly benefitted. I will return for performance coaching in the near future. 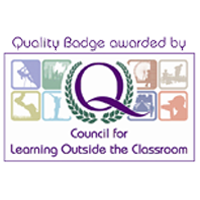 As a novice I would strongly recommend Rock and Sun to would be climbers and novice climbers wishing to improve their knowledge and ability. ...from Sergio. I climbed way beyond the goals I'd set for myself due to the encouragement and much needed push outside my comfort zone. I'll definitely be back! ...His coaching is excellent, and he is so accommodating for all levels of climber. I certainly notice an improvement in my climbing level after spending a week in Spain. I am looking forward to developing my technique. ...and he ensured there was always a climb at everyone's ability available. His coaching was excellent and I feel I learnt so much. ...While my head wanted to do more each day, my body had just the right amount. The accommodation was good, although the water pressure in the shower in the outhouse was almost non-existant which wasn't ideal for a mid-nov trip. ...He really knows what he is talking about and is very good at coaching. Great!